Visit our Member Directory for a full listing of premier tour operators who support our mission of preserving and protecting the Galápagos Islands and promoting responsible tourism. 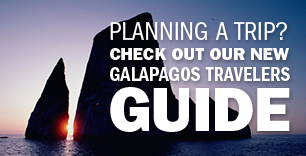 From what to pack to what you'll see, our in-depth Galápagos Travel Guide has all the information you need to start planning your perfect adventure. The Galápagos Islands are a unique and irreplaceable natural treasure, but they face many threats including invasive species, population growth, and illegal fishing and poaching. Make a donation to our Galápagos Traveler Conservation Fund and support critical conservation initiatives in the Galápagos Islands. Traveling to the Galápagos Islands offers wildlife lovers and natural history enthusiasts the remarkable opportunity to experience the world as it once was. Truly a priceless natural treasure, the Galápagos Islands have been called a ‘unique living museum and showcase of evolution’ and are home to an array of fascinating animal and plant species – many of which are found nowhere else on earth. 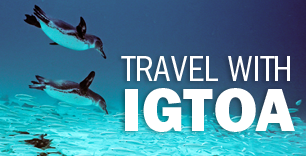 Visitors can experience the islands by traveling on Galápagos tours offered by a member of The International Galápagos Tour Operators Association (IGTOA). Because of their incredible natural beauty and unique wildlife, the Galápagos Islands have become a popular travel destination, but they are threatened by a variety of factors including climate change, illegal fishing, invasive species, urban development – and even tourism itself. 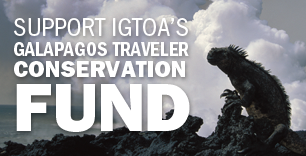 However, IGTOA and its members are actively working to preserve and protect the area by promoting responsible, well-regulated, low impact Galápagos Islands travel and by supporting critical conservation initiatives and scientific research there. The International Galápagos Tour Operators Association’s member companies represent the highest standards of quality and professionalism in the travel and tourism industry. When you embark upon a Galápagos Islands tour with an IGTOA member, you can rest assured that you will have a great experience and that you will be doing your part to support the lasting preservation of this priceless world treasure.